Let’s talk about self care for a minute: something easily and often neglected, yet unbelievably imperative for survival. A way I’ve learned to take care of myself a little more is through yoga – I just started practicing this year! – so I decided to create an outline of the most chill day, complete with my favorite things, 100% focused on treatin’ yoself to some TLC. Leggo. I start with diffusing oils at home: typically lavender, eucalyptus, jasmine and ylang ylang. I oil pull for 20 minutes, and then take a lavender oil capsule from Nature’s Way CalmAid as well as a b12 vitamin with a room temp glass of water + a half a lemon squeezed in. After eating a light, healthy breakfast, I’ll make an infused water for my yoga class, grab my gym bag and mat, and head to the studio. You’re going to want a comfortable, breathable outfit. Most people are happy with leggings – cropped or long, and a tee or tank of some sort. I love a longline sports bra with a high waisted legging; sticking to form-fitting silhouettes has been good for me because the baggy stuff tends to fall all over the place when I’m doing any kind of inversion or down dog. I’m freaking obsessed with Suja Lavenade – a vanilla-lavender lemonade that is by no exaggeration the nectar of the gods. It. Tastes. Like. Heaven. I’ve never tasted, nay, experienced anything like it, and to be honest, I’m considering taking out a loan, investing in a home, and building a custom refrigerated dispenser in my kitchen to keep this on tap 24/7. Before I bankrupt myself in the name of juicing, let’s talk about the health benefits: we all know that lavender is v calming and good for mellowing out, but did you know that vanilla bean is essentially nature’s chill pill? I had no idea. Get this – vanilla beans contain magnesium, which “relaxes nervous tension, prevents or helps with mild depression and PMS [oh hell yeah], and optimizes neurotransmitter function for optimal serotonin and dopamine production .” Amaze, right? It also has calcium which reduces anxiety and stress by naturally mitigating cortisol production, and potassium which can lower blood pressure. Bury me in em. So yeah, go grab a Lavenade, you can get them at Whole Foods! 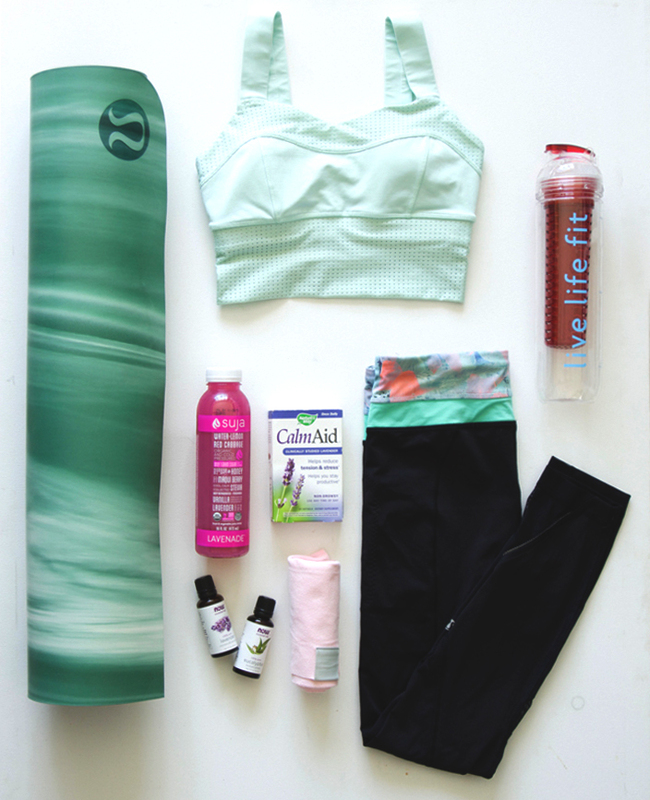 As far as your yoga mat goes, it doesn’t need to be expensive or fancy…. or it totally can be. Apparently the Rolls Royce of yoga mats is this one here from Manduka. I would assume my lululemon mat is somewhere around Mercedes level, but you could get by just fine with something from Target. Now that I think of it, I was totally using a Suja mat (thanks, guys!) before I got my lulu one. If you’re really going for it, you could do a back to back yoga session, and take a flow class and a yin deep relaxation class. After yoga, if I’m having a total treat-yoself day (read: came into money suddenly), I’d opt for a massage (if you’re local, hit up Jenny at Massage Carlsbad on Roosevelt – she coo) or a pedicure, possibly a salmon lunch from Whole Foods (salmon is also one of those miracle brain foods), and most likely another Lavenade because lushury. If less lushury, I’ll go for a walk on the beach (yay cliches!) and get a sandwich or something inexpensive. To complete the day and fully decompress, I’d recommend disconnecting from social media and email *gasp 😱* and finding a good book or an old movie, making yourself a healthy dinner and a hot tea, taking a bath, and getting a really good night’s sleep. Keep the oil diffuser by your bedside, take a Theanine, grab a nice eye mask and get some zzzs to fully recharge after a day of renewal. Clear your Saturday schedule and start the plans to unwind; it’s time for some serious self care. PS. I’m excited to share my Strong Girl Spotlight interview! This feature on The Strong Movement blog highlights a lot of my fitness journey, and how much it has impacted my life. Thank you to Suja for the life-changing Lavenade!! 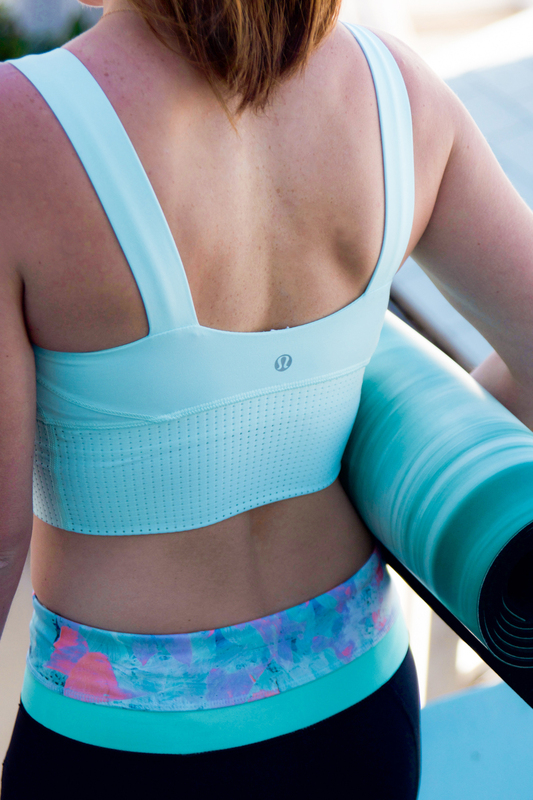 what’s the name of the lulu sports bra and pants?! They are so cute! I love lulu! I hate they retired this style! I am obsessed with this sports bra!